We live in an increasingly connected world, where much of our lives is being captured digitally as data; our transactions, our interactions, our movements. And as more things become connected through the Internet-of-Things (IoT), even more data is being generated. This is known as big data. Even though the data is generated by individuals, it doesn’t belong to us but to those collecting it, ie. the supermarket that tracks our purchases, the search engine that monitors our searches. And even if our own data is returned to us, we would not really know how to use it because the data is presented in a way to help the institution that collected it, not us. As individuals, we are also become increasingly worried about online privacy and security, and some of us are starting to withdraw from being too digitally visible. Governments may start addressing these privacy and security issues through regulation, thereby increasing costs. This could make institutions reluctant to invest in innovation, which in turn could lead to a downward spiral – less innovation, less business opportunities, less jobs. There is a need to reverse this and create an upward spiralling effect on the digital economy. 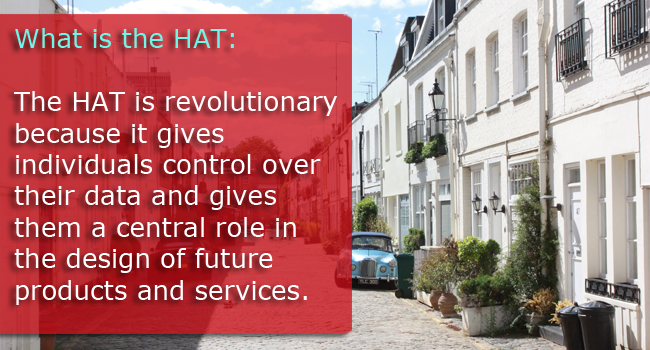 And this is what the Hub-of-All-Things (HAT) project aims to do. HAT is funded by Digital Economy / NEMODE project £1.2 million 2 years.